MiniFinalDrives is here to help when you need to replace or fix your Sumitomo final drive or travel motor for your mini or midi excavator. 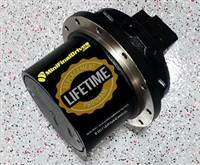 Having over 50 years of industry experience on hand helps MiniFinalDrives ensure that you can count on us for the right Sumitomo final drive motor that will fit and perform like you need and that will last you a lifetime, covered by our Lifretime Replacement Program. We keep them in stock at all times, and we offer Free and Fast shipping to your door! Let us help you today with all your Sumitomo final drive and travel motor needs - we're ready to help!